This is the best Macaroni and Cheese I have made at home. The evaporated milk and dry mustard makes this dish extra special. Once again I will refer you to The Perfect Recipe. This is the ultimate in Macaroni and Cheese. It's hard to beat homemade macaroni and cheese. Heat oven to 350 degrees and set a 1 1/2 quart heatproof dish, such as a souffle pan in the oven to warm. Mix bread crumb ingredients together in a small baking pan set aside. Bring 2 quarts of water to a boil in a large soup kettle. Add 1 1/2 tsp. salt and macaroni; cook until almost tender, but still a little firm to the bite. Drain and transfer to a preheated dish and stir in butter to melt. Meanwhile, mix eggs, 1 cup evaporated milk, pepper sauce, 1/2 teaspoon salt (less if you are using American cheese) 1/4 teaspoon pepper and mustard mixture in a small bowl. Pour egg mixture over noodles along with three-fourths of cheese; stir until thoroughly combined and cheese starts to melt. Place breadcrumbs in an oven to toast until golden brown, 10 to 15 minutes. Remove from oven and set aside. Place the pan of macaroni and cheese in the oven too and bake for 5 minutes. Remove pan from oven; thoroughly stir macaroni mixture adding a little remaining milk and cheese. Return to oven and cook 5 minutes longer. 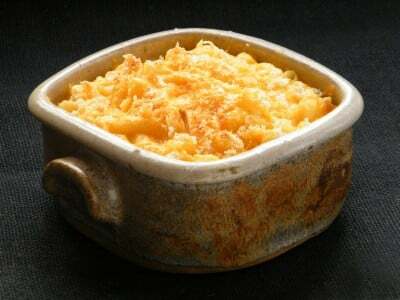 Remove macaroni pan from oven and stir thoroughly so that macaroni and cheese cook evenly adding additional cheese and milk if mixture does not look moist and creamy. Return to the oven for a total of 20 minutes, removing the pan from oven once more to stir in remaining milk and cheese. Serve immediately, sprinkled with breadcrumbs. Please note: I personally forgo the breadcrumbs. Once again I can't even tell you how good this stuff is! I would never normally comment, but I feel I have to go out of my way to leave my feedback. This Mac and Cheese was AWFULLY good. I am sorry you didn’t feel this was a good recipe, I really thought this was the best recipe for macaroni and cheese, it was wonderfully rich. Is this a custard-type mac and cheese? I’ve been trying to find the ultimate recipe, but it seems as though southern recipes tend to have a custard/eggy consistency. It makes me nervous b/c the last recipe I tried called for 2 eggs -and I’m not a fan of the southern style. I don’t think this recipe is too much of a custard style, it is a little firmer than a straight cheese sauce macaroni and cheese though. I served this as a side dish for a small lunch party (7 people). It went over very well. I’ve never made mac-and-cheese that didn’t come from a box before – this was far and away better, and it really wasn’t that much more work. I tried to take a shortcut by using bread crumbs out of a can, since I had some leftover. It didn’t ruin the dish, but it was definitely better without them. Hello love your site but you had a Wendys Chili years ago can you put it up again?